Photo: Sandra Demberger, Partnership for the Delaware Estuary. Used with permission. And that’s exactly the point, says Kreeger. 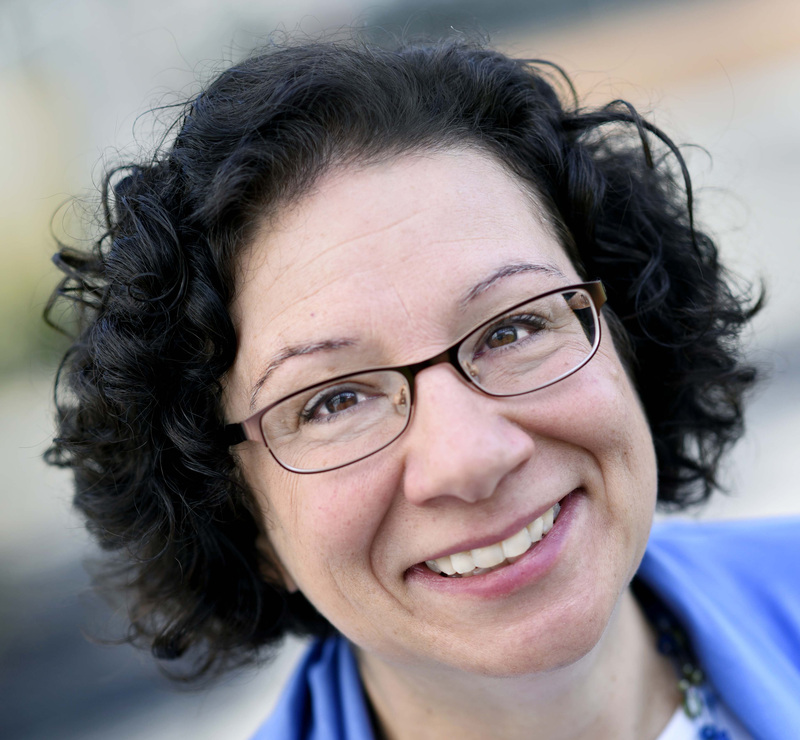 She’s senior science director at the Partnership for the Delaware Estuary, a nonprofit organization designated by Congress to protect a three-state area where the freshwater of the Delaware River meets saltwater of Delaware Bay. The demonstration hatchery lets the Fairmont Water Works’ 100,000 annual visitors witness the complex process of raising freshwater mussels and explains why anyone would want to raise them. “This freshwater mussel recovery program is designed to restore mussels for various ecological benefits, and in particular, for clean water,” Kreeger says. As she explains, a freshwater-mussel bed covering a stretch of river bottom a bit smaller than two football fields will filter 10 million gallons of water a day and remove 10 tons of suspended matter, such as silt, algae and bacteria. “Those are real numbers,” based on surveys of healthy freshwater mussel beds, she says. There are other programs that restore oysters and marine mussels in saltwater habitats. And there are other programs hatching freshwater mussels to save them from extinction — they’re one of the most endangered groups of animals in the world. But the Partnership for the Delaware Estuary has the country’s only program raising relatively common freshwater mussel species to put them to work as nature’s own water filters. Photo: Lance Butler, Philadelphia Water Department. Used with permission. It’s no accident that the demonstration hatchery is in a water-treatment plant. In theory, healthy populations of freshwater mussels in rivers and streams can reduce the cost of water treatment. Kreeger doesn’t want to oversell their benefits as water purifiers, though; she says freshwater mussels can’t clean up every mess. They’re sensitive to toxins, metals and acid mine drainage. But they still clean up a lot. As visitors tap and swipe the interactive displays outside the hatchery’s glass walls, they learn that freshwater mussels filter out particles and let enough sunlight reach the bottom of rivers and lakes so that submerged aquatic vegetation can grow. These underwater plants provide oxygen and food for other water-dwellers, such as fish. Together, the freshwater mussels and the underwater plants engineer healthier aquatic ecosystems. Photo courtesy Partnership for the Delaware Estuary. Used with permission. Once upon a time, natural populations of freshwater mussels filtered sediment out of rivers and lakes. Then pollution, development and dams wiped out some of their populations and reduced others. Today 95 percent of Pennsylvania’s rivers and streams that were once home to freshwater mussels no longer have them, Kreeger says. Raising freshwater mussels is complicated by their strange life cycle. Larval mussels spend a few days to a few weeks living as parasites on the gills of specific species of fish; many mussel species rely on just a single fish species for this parasitic relationship. For a short time each spring, visitors to the Water Works see blueback herring (Alosa aestivalis), American eels (Anguilla rostrata), sometimes largemouth bass (Micropterus salmoides), banded killifish (Fundulus diaphanus) and white perch (Morone americana) swimming in buckets or tanks in the hatchery as they serve as hosts for the newly hatched mussels. A larger facility in Virginia, the Harrison Lake National Fish Hatchery, bred mussels from the same local stock and sent the young mussels back to the Delaware estuary program. 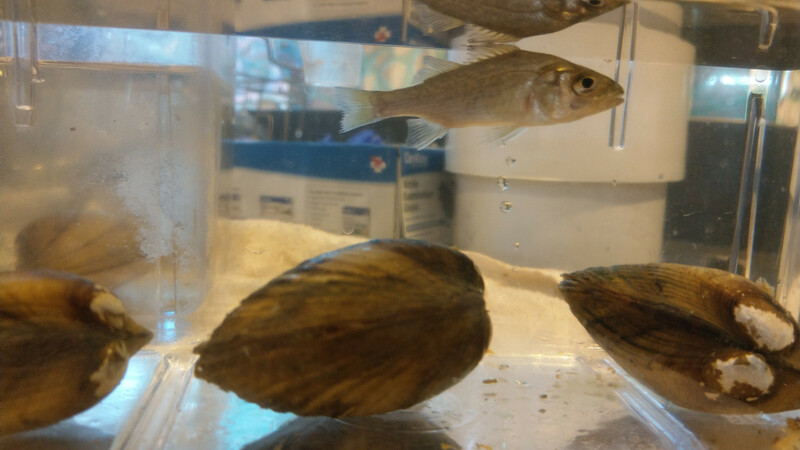 In the program’s first year, in 2017, it raised mostly one species of freshwater mussel, the alewife floater (Utterbackiana implicata), along with a few eastern elliptio (Elliptio complanata). This year it added tidewater muckets (Leptodea ochracea), eastern pondmussels (Ligumia nasuta) and yellow lampmussels (Lampsilis cariosa), bringing its stewardship up to five species. That second step requires some complex procedures. The young mussels babied at the Water Works hatchery require research by Kreeger and other staff to find the perfect water sources to circulate through their small tanks, as well as the best-sized food to dribble into the water through an automated system of tubes and holding tanks. When the young mussels are about half a millimeter in size, they are moved out of the limelight at the hatchery to rearing ponds, where they live protected in floating baskets until they grow to fingernail size — too big to be a snack for every creature out there. 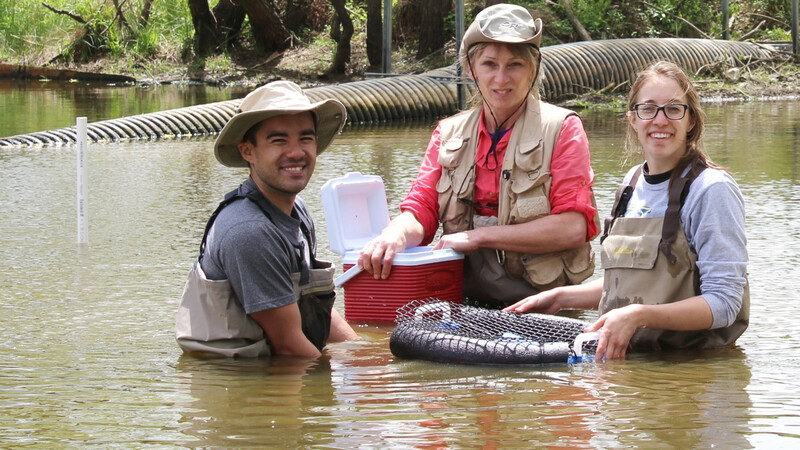 This month, a year and a half after they hatched, the first 30,000 freshwater mussels from the program will start to leave their ponds and be released into their permanent homes. Some, Kreeger says, will become part of a living shoreline project on the Christina River in Delaware. Others will provide the start for freshwater mussel gardens tended by schools and nonprofit organizations. The rest will be placed in rivers and streams that Kreeger has been studying for years. At first, she’s targeting middle quality streams — not impaired streams where the mussels might quickly die out or high-quality streams that already have mussels. 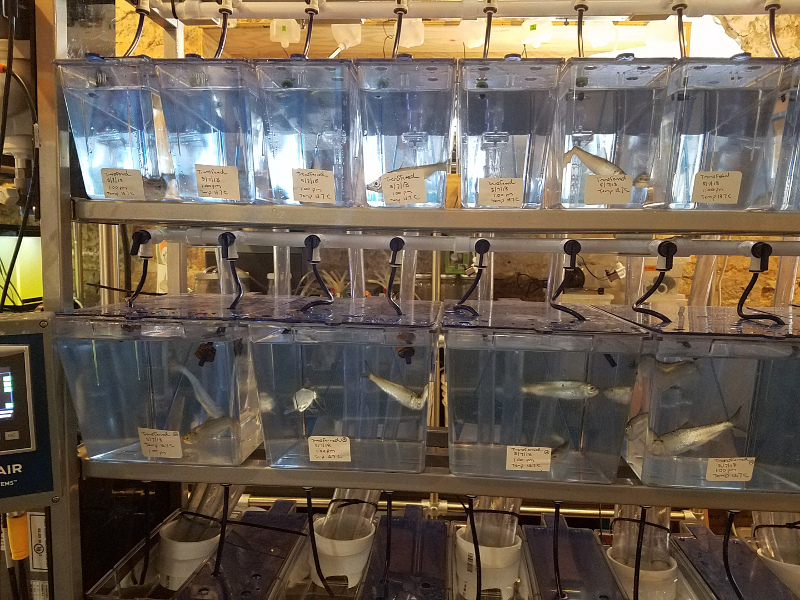 The demonstration hatchery at the Fairmont Water Works was built with a $300,000 grant from the Pew Charitable Trusts and run in partnership with the Academy of Natural Sciences of Drexel University, Philadelphia Water Department and U.S. Fish and Wildlife Service. Its main function is education, with research coming second and the propagation of mussels third. Kreeger says the planned production hatchery will cost $7.9 million to build and $400,000 to $500,000 a year to run. The dollar value of the mussels’ ecosystem services hasn’t been calculated in a scientific way yet, but Kreeger’s past research leads her to believe the hatchery is a bargain. The new hatchery will raise a half-million to a million new freshwater mussels each year. That’s how many it takes to make a real difference in river health, Kreeger says, and also where ethical issues may come up. Will these common species compete with rarer species? Should lower-quality streams that can’t sustain freshwater mussel populations naturally be restocked periodically, the way hatchery trout are restocked? To guide the way, Kreeger is putting together an advisory council of researchers and conservationists. “I think that the Delaware estuary program can serve as a pilot that can demonstrate to other areas of the country that this is worthwhile,” Vaughn says. The eastern United States have the bulk of the freshwater mussel species diversity and numbers, but much of the country has at least a few species whose numbers can be enhanced for cleaner water. Newton says she’s heard real interest in freshwater mussel restoration for clean water from cities in the upper Mississippi watershed. But will cities see a calculable benefit from restoration, or are they better off spending their money on new water treatment plants? Thirty years ago the benefits of freshwater mussels were hidden beneath the surface of rivers, lakes and streams. Kreeger has put them on display at the Fairmont Water Works. With the new, larger hatchery and a return to their original habitat in the lower Delaware River watershed, they may star on an even larger stage. © 2018 Madeline Bodin. All rights reserved. is a freelance environmental and science journalist. She frequently writes about ecology and the science of wildlife conservation, and always seeks to tell a good story.